Once you have all of the ingredients on hand, you can prep and bake these crackers in under 15 minutes, which is great timing to coincide with heating up some soup to dunk them into. These crackers are ridiculously easy, loaded with nutrition, and make a huge batch: the perfect soup companion. Mix and match the flours and add-ins to your taste–they are pretty foolproof. Preheat oven to 450F. Tear off a sheet of parchment paper the size of your baking pan. If you want very thin crackers, use two baking sheets. Put the sorghum flour, teff flour, baking powder, seeds and salt in a large bowl. Whisk well. Add the olive oil and about 1/4 cup water. Stir to mix, adding additional water for it to become cohesive. Place the dough directly on the parchment paper. Roll thinly—the thinner the dough, the thinner the crackers will be. 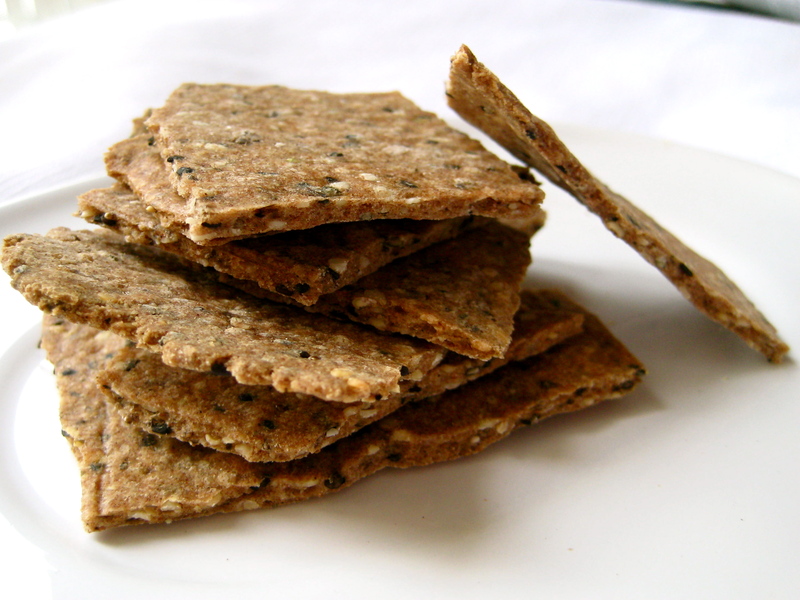 If necessary, divide on two parchment sheets for thin crisp-style crackers. Cut the dough with a sharp knife into squares; you don’t have to pull them apart, just cut through to the pan. Transfer sheets to oven and bake for about 3 to 5 minutes, until they are firm enough to move (very thin crackers will take only a few minutes). They will slightly shrink, making it easy to flip the crackers using a metal spatula. Bake for another 4 to 5 minutes, depending on thickness. Let cool on the pan before serving or storing. They will become more firm as they cool. You say, “bake 3 to 10 minutes per side” — does the “per side” mean you flipped them over during baking? And if so, how do you do this? Thanks! Hi Denise! Sorry for the confusion. Bake for about 5 to 8 minutes until they are firm enough to flip an starting to brown, then a couple minutes more until crisp and browned on the other side. The time will vary based on the thickness they are rolled to. Are you flipping them by lifting the sheet of parchment paper? Flipping them onto a second sheet of parchment paper? Are you able to flip the entire piece of dough without it crumbling? I made these last week without flipping and cut them up and then flipped them so they would crisp up. Just wondering how you are getting a sheet pan of dough flipped over without breaking. Thanks! They were pretty tasty. Thanks for the message and sorry the instructions are so unclear! I am going to rewrite it above so it makes more sense.